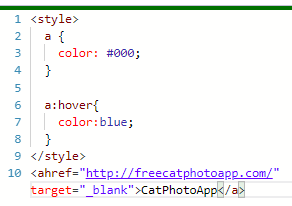 The anchor tag color should remain black, only add CSS rules for the :hover state. The anchor tag should have a color of blue on hover. User Agent is: Mozilla/5.0 (Macintosh; Intel Mac OS X 10_13_4) AppleWebKit/537.36 (KHTML, like Gecko) Chrome/66.0.3359.181 Safari/537.36. You can only have one for each property in a block. So you can’t have two color props. Good luck and have a happy coding. it does’nt work , maybe it’s a bug in the website ?? Good luck @marouane1987 and have a happy coding. Hello. Sorry, but this is so simple and I cannot see what am I doing wrong. It apparently worked when I reloaded the page. not working for me, is this a bug ?